What would your team do with the No. 1 pick ? We looked into our crystal ball and broke down each team's dream prospect in the 2017 NBA draft. Let the debates begin. Editor's note: This story was syndicated from Fansided.com and written by John Buhler. The 2017 NBA Draft Lottery will be on Tuesday night at 8:00 p.m. ET. What should each lottery-eligible NBA team do if they land the No. 1 overall pick? It’s that time of the year for some people in the basketball world to go crazy over ping-pong balls. Yes, it is that important in the landscape of the NBA. Tuesday night will be the 2017 NBA Draft Lottery. Representatives for 14 NBA teams in possession of lottery picks will get to see if they can end up with the No. 1 overall pick in a loaded draft. This looks to be a significantly better rookie class than whatever the NBA got last year. Expect the 2017 NBA Draft to be littered with many viable starting point guard prospects. Shooting on the wing might be hard to find, but there are a handful of solid forwards that could thrive playing the stretch four or five. Should any of these 14 teams end up winning the 2017 NBA Draft Lottery, what should they do with the No. 1 overall pick? Do they draft the best player in the draft, draft for need or orchestrate a trade to acquire more future assets. Here is a look at what each team in the lottery could do at No. 1 should they win? Seeing Rajon Rondo do some good stuff for the Chicago Bulls in Games 1 and 2 before getting hurt almost makes up for the Miami Heat not qualifying for the Eastern Conference Playoffs. 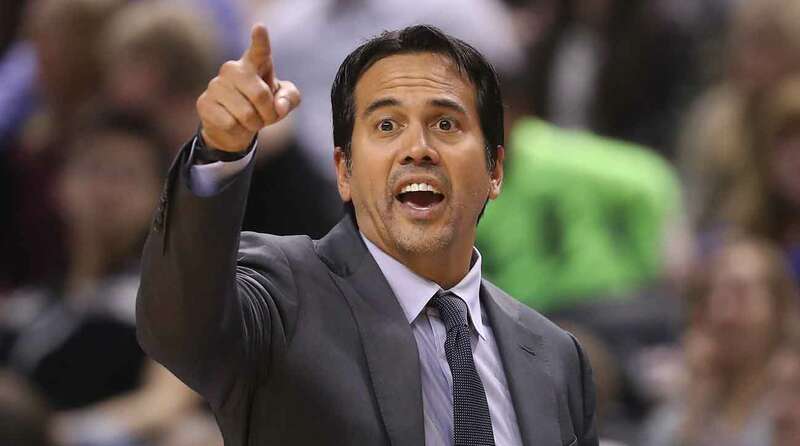 Erik Spoelstra’s team went from hot garbage to being the little engine that almost could. Miami now finds itself reluctantly in the 2017 NBA Draft Lottery. The Heat have by far and away the worst chance at winning the lottery at only 0.5 percent. Leapfrogging everybody just does not seem in the cards for the Heat this May, but what if it does happen? Again, Miami is one of those teams that is not in dire need of a point guard. Goran Dragic seems to be a stabilizer at the point that Spoelstra frankly never had in the Big Three era. Sorry, Mario Chalmers. Hassan Whiteside is a big building block at center. Dion Waiters has finally found himself in South Beach. Overall, things are getting better in Miami. Tyler Johnson and Luke Babbitt played well at times last year. Besides missing the playoffs, the only sour note for the Heat was the Justice Winslow injury. Knowing that team president Pat Riley enjoys fleecing other front offices more than anybody, we have to expect that he’d have something brilliant in the works for the Heat should they get the No. 1 overall pick. Josh Jackson out of Kansas would provide the type of athleticism at forward that Miami is lacking. The Heat could get him in that No. 3 to No. 6 range. 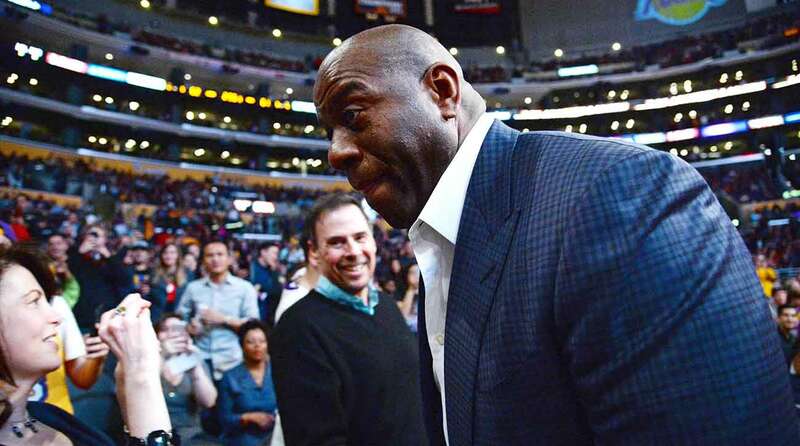 The Los Angeles Lakers have made more than their fair share of front office mistakes of late. Depending on if they have a future first-round pick or three to burn, Riley should ask for at least two future first round picks from the Lakers and Larry Nance Jr. to even the deal out. With Tim Connelly running the Denver Nuggets’ front office, his methodical moves to this rebuild have been pragmatic, but haven’t always worked. While the Nikola Jokic and Jamal Murray draft picks look to be swell, the Jusuf Nurkic trade with the rival Portland Trail Blazers was a disaster. Then there’s the Emmanuel Mudiay draft pick. That doesn’t look all that great in hindsight either. Denver only has the 13th-best odds to win the 2017 NBA Draft Lottery at only 0.6 percent. In the parallel universe where the Nuggets leapfrog 12 teams to get the No. 1 pick, we have to assume that Connelly will use that selection as leverage to move back to acquire more assets. Being that Mudiay will only be entering his third year in the league, now is not the time for the Nuggets to draft his replacement. The sample size is not strong enough just yet to prove that he’s never going to figure it out. Connelly knows that Jokic is a star, but has to find a player that could work alongside him in the frontcourt. Drafting power forward Jonathan Isaac out of Florida State could be the choice Denver does make with their first round pick. Obviously, the Nuggets would have to dump Kenneth Faried to whichever team trades up to No. 1 to presumably draft a point guard. 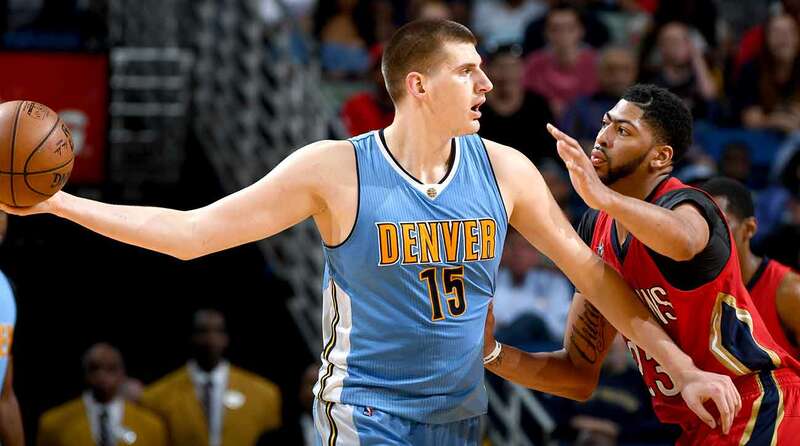 Denver taking Isaac could also indicate that Denver is open to parting ways with talented, but always injured small forward Danilo Gallinari in free agency. The Phoenix Suns would be a team that could trade up to get the No. 1 pick from the Nuggets. They already have all the Kentucky Wildcats point guard they could ever want, but they still want more. If Phoenix trades up to No. 1 to draft Lonzo Ball out of UCLA, Eric Bledsoe or Brandon Knight could be interesting fits in Michael Malone’s Denver offense. The Detroit Pistons only have the 12th-best odds at getting the No. 1 overall pick in the 2017 NBA Draft Lottery at only 0.7 percent. 2016-17 was a massively disappointing one for the Pistons, as they didn’t get to build on the on-court success from 2015-16. Detroit doesn’t necessarily needed a point guard with their first-round pick. Head coach/president of basketball operations hand-picked former Oklahoma City Thunder sixth man Reggie Jackson to be his guy. The Pistons also need to figure out if they are going to pay shooting guard Kentavious Caldwell-Pope top dollar before he hits unrestricted free agency. Where Detroit could probably use the biggest upgrade is in the frontcourt. Center Andre Drummond is an All-Star level player at the five, but finding the right power forward to play alongside him has been very difficult. One guy that could make sense for the Pistons with their lottery pick is Florida State Seminoles forward Jonathan Isaac. 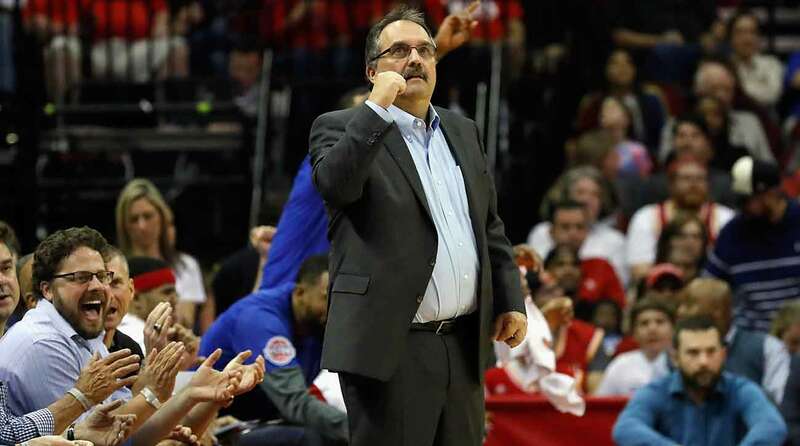 He could play some variation of the three or four for the Pistons to help create space for the Pistons’ offense to improve. Obviously, Isaac is not worthy of the No. 1 overall pick. Expect him to go in the No.5 to No. 10 range of the lottery. The Orlando Magic would be arguably the best team to trade up to No. 1 to draft their new starting point guard. Van Gundy would be able to still draft Isaac, as well as gain Nikola Vucevic as the elite wall material he’ll need big time to win in Motown. Raise your hand if you trust the Charlotte Hornets to know what they are doing in a draft day war room? Exactly. 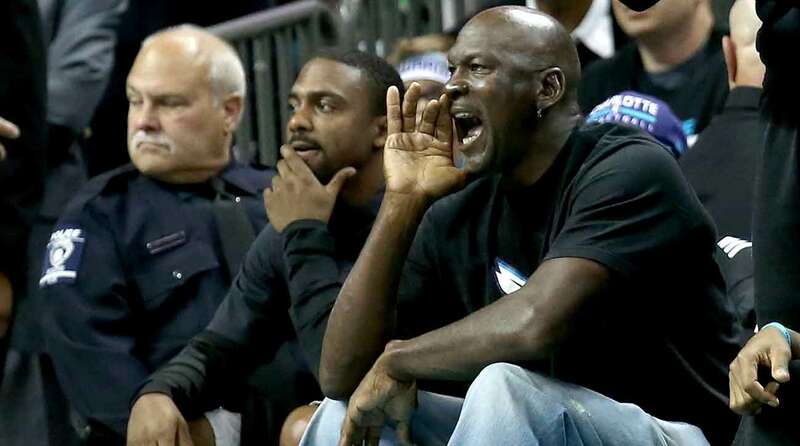 If a player was excellent in the NCAA Tournament, owner Michael Jordan is going to find a way to get that overrated player on his roster. Charlotte may only have a 0.8 percent chance to win the 2017 NBA Draft Lottery, but we have to believe that this is the team that will come out of nowhere to land that highly coveted No. 1 overall pick and totally blow it. The Hornets don’t need a point guard because Kemba Walker is incredible. However, he could use some help out on the wing in terms of jump shooting besides Nicolas Batum. Michael Kidd-Gilchrist is probably never going to fix his broken jumper, so why not use the No. 1 overall pick on another former Kentucky Wildcats shooting guard in the form of Malik Monk? Monk is exactly the type of player that the Hornets need. He can space the floor with his smooth stroke from distance. Monk could be able to create his own shot off the dribble and for others with the ball in his hand. Charlotte could get back into the NBA Playoffs in 2018 if he has a great rookie season. While the Hornets could absolutely trade back to draft Monk at around No. 10, they didn’t want to move back from No. 9 because Frank Kaminsky was that important of a building block for them. In theory, Charlotte will take their guy wherever the wind up in the lottery. Don’t expect them to trade the No. 1 pick. Monk could be the biggest shocker at No. 1 since Anthony Bennett went to the Cleveland Cavaliers back in 2013 out of UNLV. It’s not looking very promising that the New Orleans Pelicans will be keeping their 2017 first-round pick. As part of the DeMarcus Cousins trade with the Sacramento Kings, the Pelican’s first-round pick is only top-three protected. While New Orleans has a 1.1 percent chance of getting the No. 1 overall pick, the Pelicans only have a 4.0 percent chance of being able to keep their first-round pick. Expect this pick to belong to the Kings barring something crazy happening in the 2017 NBA Draft Lottery. Though the Pelicans will likely want to bring back veteran point guard Jrue Holiday for next season, he will be one of the more intriguing point guards to be hitting free agency this summer. He could have priced his way out of New Orleans. If that is the case, look for the Pelicans to go point guard at No. 1. While Lonzo Ball or Markelle Fultz could be interesting fits at No. 1 for the Pelicans, the point guard that would make the most sense for what head coach Alvin Gentry wants to do is De’Aaron Fox. 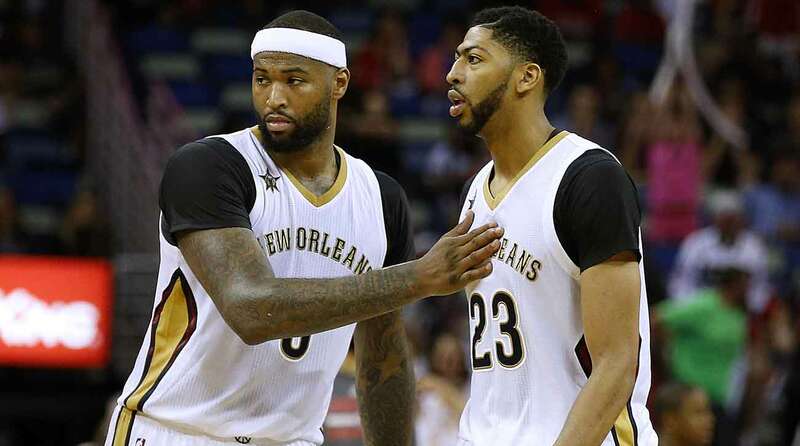 Fox could be able to assimilate nicely to The Boogie and The Brow backcourt in New Orleans. Like Cousins and Anthony Davis, Fox did play one year at Kentucky under John Calipari. The Pelicans could target Fox in the No. 3 to No. 8 range should they look to move back. Teams like the Los Angeles Lakers, the Phoenix Suns, and the Orlando Magic could have the rotational frontcourt pieces that the Pelicans desperately need to help spell Cousins and Davis from time to time. The Dallas Mavericks have only a 1.7 percent chance of getting the No. 1 overall pick in the 2017 NBA Draft Lottery, but they could be a team that could use that improbable pick as leverage for trade. While Dallas could still use a Markelle Fultz or a Lonzo Ball at point guard, Yogi Ferrell has been interesting for the Mavericks as a rookie. 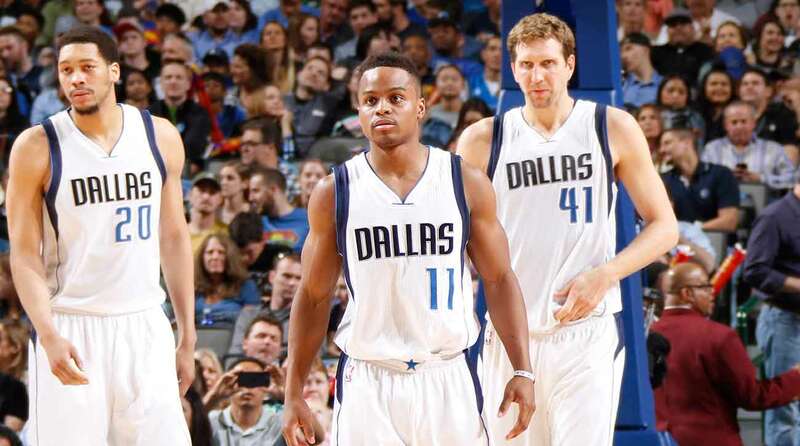 The Mavericks could look for a veteran point guard in free agency. We should probably expect them to stabilize their roster out on the wing. Ideally, Kansas Jayhawks forward Josh Jackson would be a player that could work two through four for head coach Rick Carlisle. Yes, the Mavericks have Harrison Barnes at the three/stretch four, but an NBA team can never have enough wings, especially a guy like Jackson with tremendous upside. An ideal trade partner for Dallas should they garner the No. 1 overall pick would be the Philadelphia 76ers. Philadelphia has more ammunition than any team in this draft. If 76ers general manager Bryan Colangelo is adamant about getting a point guard at No. 1, the Mavericks could trade down, still grab Jackson around No. 5, maybe pick up a future first-round pick and any player not named Jahlil Okafor or Ben Simmons. The Sacramento Kings could be a potential trade partner for the Mavericks. Sacramento could have two first-round picks this June: their own and the New Orleans’ Pelicans. 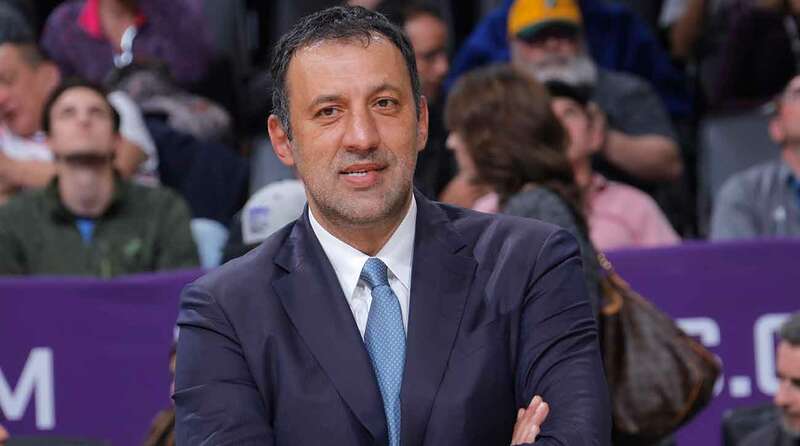 Can the Kings technically trade a pick that is below the 76ers’ to help move up to No. 1 without having to do the pick swap? Probably not, that’s the type of drama this NBA Draft 100 percent needs on June 22. Along with the Philadelphia 76ers, the other NBA team to keep a close eye on heading into the 2017 NBA Draft Lottery is the Sacramento Kings. There are so many moving pieces in play for the Kings’ lottery chances, it’s borderline ridiculous. Their own 2017 first-round pick would go to the Chicago Bulls if it falls out of the top-10. Sacramento does have the eighth-best odds at getting the No. 1 overall pick at 2.8 percent. The Kings also have a 72.5 percent chance of getting the No. 8 pick. The chances are minimal that they fall and this No. 11 to No. 14 pick goes to the Bulls. Sacramento could also see their first-round pick swapped with the 76ers should the Kings leapfrog the 76ers. Philadelphia has the fourth-best odds at winning the lottery at 11.9 percent. The Kings will very likely have the New Orleans Pelicans’ coming their way, as it’s only top-three protected stemming from this winter’s DeMarcus Cousins trade. Sacramento has a 96 percent chance of landing the Pelicans’ pick. Since Philadelphia will execute the rights to a pick swap at No. 1 no matter what, the best case scenario in that situation is that Philadelphia only moves up from No. 2 to No. 1. Sacramento would then take the second-best player in the draft in UCLA Bruins point guard Lonzo Ball. Ball looks to be the type of point guard that could thrive next to Buddy Hield in the Kings backcourt. Having stability at point guard would be key for Dave Joerger to right this constantly sinking ship in Sacramento in his second season as the Kings head coach. The New York Knicks do not know what they are doing. They can’t fool us anymore with the allure of Madison Square Garden, The Triangle, or the idea that any self-respecting free agent will want to play there. Without power forward Kristaps Porzingis, this would unfortunately be a dead NBA franchise. 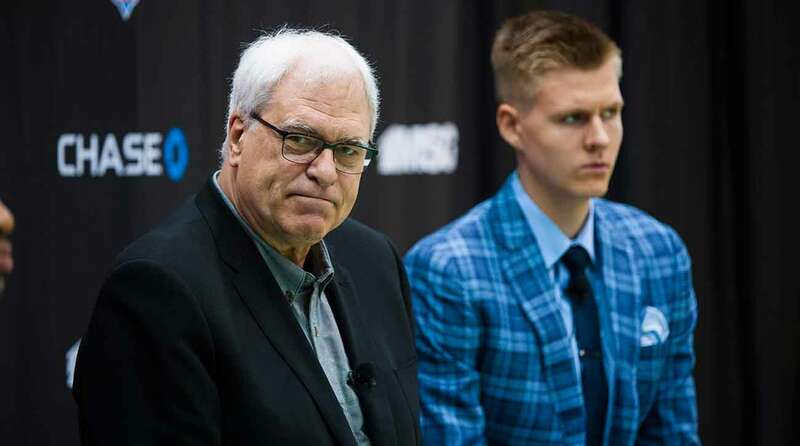 That being said, the Knicks have shown an ability to draft well with Phil Jackson calling the shots. He did take Porzingis No. 4 in the 2015 NBA Draft out of Latvia. With the exception of skipping his 2016-17 exit meetings, the kid has serious star potential in the Manhattan frontcourt. New York has the seventh-best chance to garner the No. 1 overall pick at 5.3 percent. The Knicks lost the coin-flip tiebreaker with the Minnesota Timberwolves. They should be okay to find talent in this deep NBA Draft, but getting the No. 1 overall pick for the Knicks would be massive. While Jackson and the Ball Family would be the biggest circus professional basketball has ever seen, New York needs to be pragmatic for once and just take the best player available at No. 1: Washington Huskies point guard Markelle Fultz. Head coach Jeff Hornacek would have his guy. Maybe Fultz is young enough to buy-in into the ramblings of how great The Triangle is? A Knicks team with Fultz at point guard and Porzignis ideally at stretch five would give this dead franchise some legitimate reason to be excited for 2017-18. If Fultz isn’t Derrick Rose, this could work out wonderfully. The Minnesota Timberwolves won the coin-flip tiebreaker over the New York Knicks for having the sixth-best odds to garner the No. 1 overall pick. While head coach Tom Thibodeau definitely needs help creating a defensive-minded basketball culture in the Twin Cities, his team doesn’t need the No. 1 pick more than most. Outside of last year’s No. 5 overall pick in point guard Kris Dunn, who remains a work in progress, the Timberwolves have hit with young talent on their roster. Center Karl-Anthony Towns has superstar potential. Andrew Wiggins projects as an All-Star out on the wing. Even the injured Zach LaVine offers great intrigue with his athletic ability. Since Minnesota went point guard at No. 5 last year, there is really no reason the Timberwolves would use the No. 1 overall pick on Lonzo Ball, De’Aaron Fox or Markelle Fultz. They’d have a tough decision to make should they get the No. 1 overall pick. Would they draft a forward in Josh Jackson out of Kansas at No. 1 or try to trade back to see if they could still land him and then some? Jackson might be the one forward potentially worth the No. 1 overall pick. He offers tremendous upside above the rim, can operate as a secondary ball-handler and looks to be a tremendous defender. Some theoretical trade partners for the Timberwolves should they land the No. 1 pick are the Boston Celtics and the Phoenix Suns. Boston would give up the high-end pick the Celtics would be getting from the Nets to have an opportunity to draft Fultz. 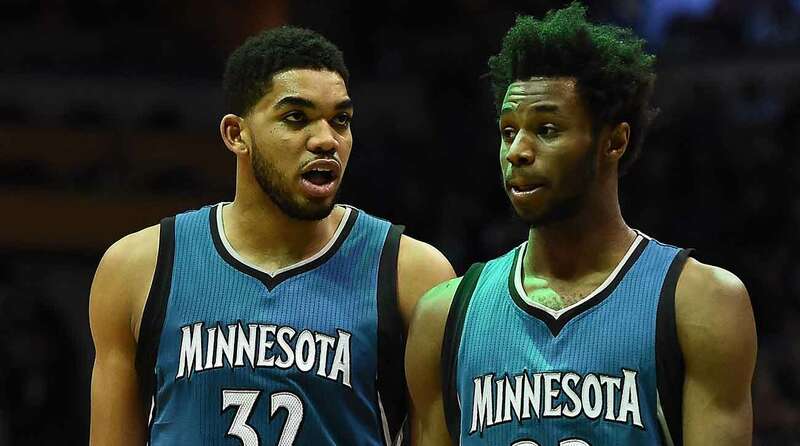 Minnesota could see if they could grab an Avery Bradley or a Marcus Smart to help out on defense for Thibodeau. Pretty much anybody not named Devin Booker could be available for trade from the Suns if they need the No. 1 pick to draft Ball. The Orlando Magic might have made a huge mistake in trading up for point guard Elfrid Payton in the 2014 NBA Draft. Not only is Dario Saric now playing for the Philadelphia 76ers, but Payton has not shown that he can elevate to being a playoff-caliber starting point guard. 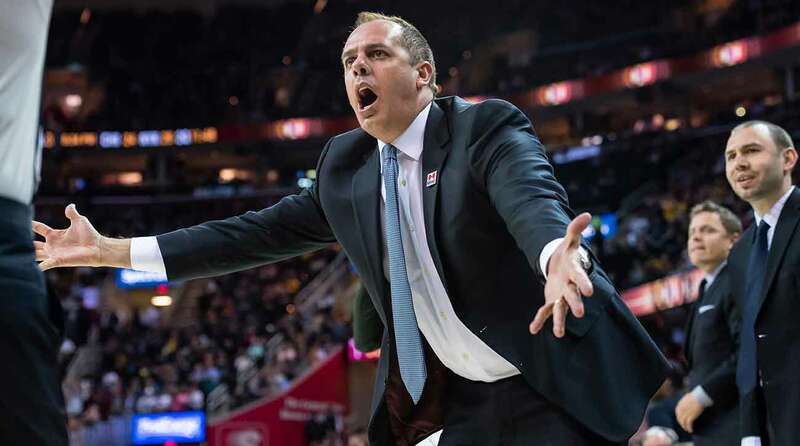 With presumably a new general manager coming at some point, look for the Magic front office to get head coach Frank Vogel a new franchise point guard to work with. Fortunately, the point guard class in this draft is loaded. Orlando also has the fifth-best odds to have the No. 1 overall pick at 8.8 percent. While the Magic could still get a solid point guard of the De’Aaron Fox or Dennis Smith Jr. variety if the ping-pong balls cooperate and give them the No. 5 overall pick, there is one guy that would be an excellent reach pick for them should they get a crack at No. 1: Washington Huskies point guard Markelle Fultz. Tabbed as a point guard of the Kyrie Irving prototype, Fultz can be that reliable ball holder that Vogel will need to get this offense out of the Eastern Conference basement. Fultz can not only create his own shot off the dribble, but could give the Magic a batter facilitator to feed the Orlando players out on the wing or down in the low post. We have to expect that Orlando goes point guard, as the Magic are one of the very few teams in the league that isn’t strong at that position group. The Magic still have a myriad of problems from their semi-thought out roster construction, but getting Fultz at No. 1 could magically make them feel better about the state of their basketball team. The Philadelphia 76ers will be by far the most fascinating team to watch work the NBA Draft board this summer. They went 28-54 in 2016-17 to end up with the fourth-best draft lottery odds at 11.9 percent of getting the No. 1 overall pick. In addition to their four second-round picks (36, 39, 45, 50), Philadelphia has a 53.1 percent chance of getting the Los Angeles Lakers’ first-round pick, as it is only top-three protected. 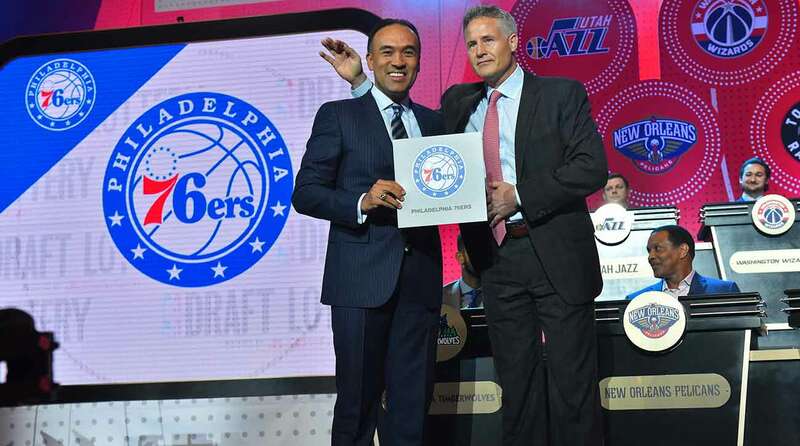 That also means that the 76ers have a 53.1 percent chance to have two of the top-seven picks in the draft, as they are guaranteed a top-seven pick based on the regular season finish. Since Philadelphia is still about a year or two away from really getting somewhere in their rebuild, it would not be shocking to see them trade their No. 1 overall pick and still get their guy in the top-seven. Kentucky Wildcats point guard De’Aaron Fox will be picked somewhere in that No. 3 to No. 8 range in the draft. He looks to be a player that would fit in very well with what Brett Brown is trying to do in the backcourt. He’d play more cohesively with small forward Ben Simmons than would ball-centric Markelle Fultz of Washington. Fox wouldn’t be the perpetual ice cream headache if the 76ers do align themselves with the Big Baller Brand. Philadelphia could trade back to No. 4 or No. 5 to take Fox. The 76ers could see if they could get Jimmy Butler from the Chicago Bulls for the No. 1 overall pick if the Bulls do end up with the Sacramento Kings’ first-round pick that is top-10 protected. Basically, the 76ers could get a point guard like Fox plus a boat load of other players and assets for the No. 1 pick that they don’t necessarily need this summer. Things are getting slightly sunnier in Philadelphia in 2017. Tuesday night will go down as one of the most definitive moments in Los Angeles Lakers history. No team in the NBA has more at stake on some random ping-pong balls than the Lakers. While they do have the third-best odds at winning the 2017 NBA Draft Lottery at 15.6 percent, the Lakers will not get to keep their pick if it falls out of the top three. All the Philadelphia 76ers need is one team to jump the Lakers to get Los Angeles’ 2017 first-round pick. This all stems back to the four-team trade involving Dwight Howard going from the Orlando Magic to the Lakers in summer 2012. The Lakers may have a 15.6 percent chance to get the No. 1 overall pick, but only have a 46.9 percent chance of keeping their first-round pick. If the Lakers land fourth, fifth, or sixth in the NBA Draft Lottery, that pick becomes the 76ers’ second first-round pick. We all know that the Lakers are going to take Lonzo Ball out of UCLA at either one, two, or three if he is available. Many feel that Boston will take Markelle Fultz out of Washington at No. 1 with the Brooklyn Nets’ pick. Expect Ball to go to either Los Angeles or Phoenix, whichever team picks first. Ball on the Lakers would give them potential star power they have been lacking since Kobe Bryant exited his prime in 2012. The idea is that Ball would play the point and the Lakers could kick D’Angelo Russell out to the two. That is a backcourt many would want to watch next season. The Phoenix Suns were one of the hardest teams to watch this past season. They had so many guards from Kentucky on their roster, it was ridiculous. Phoenix essentially punted on its 2016-17 NBA season around February, winding up with the worst record in the Western Conference at 24-58. The Suns ended up with a 19.9 percent chance of getting the No. 1 overall pick in the 2017 NBA Draft Lottery. They have a 38.7 percent chance of landing a top-two pick, a 55.8 percent of getting a top-three pick and are guaranteed a top-five pick. 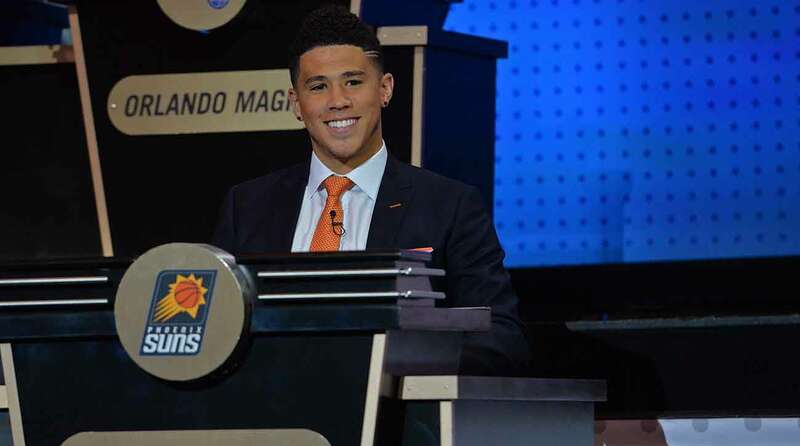 Since Phoenix already has a budding superstar at shooting guard in Devin Booker. The Suns will need to go after a point guard that would complement Booker perfectly. Washington’s Markelle Fultz seems to be too ball dominant to work in the Valley of the Sun. With Phoenix not having great luck with Kentucky point guards of late, that should eliminate De’Aaron Fox from the conversation. That leaves one obvious player that the Suns would take at No. 1 overall: UCLA Bruins point guard Lonzo Ball. Ball looks to be of the Jason Kidd point guard prototype, a gifted pass-first point guard with great on-court awareness and a strange looking jumper that might go in. A Ball/Booker backcourt would make Phoenix a more compelling NBA League Pass team next year instantaneously. Since Phoenix is not in Ball’s native California, that may not be a bad landing spot for him to grow as a man and as a professional basketball player. Ball would make Phoenix pretty interesting for sure. It will be really sad when the Brooklyn Nets end up winning the 2017 NBA Draft Lottery. Though they went a league-worst 20-62 in 2016-17 to end up with the best odds at the No. 1 overall pick (25 percent), the Nets will have to concede their lottery pick to the Atlantic Division rival Boston Celtics. This is because of the rights to a pick swap the Celtics have over the Nets, stemming from the infamous Paul Pierce/Kevin Garnett deal back in summer 2013. Since Boston finished with the best record in the Eastern Conference at 53-29, the Nets will actually end up picking No. 27 because of the pick swap. So, it does not matter what the Nets want to do at No. 1 should they ‘win’ the lottery. Boston seems to have its mind made up about where it will use its high-end lottery pick from the Nets: point guard. Boston may have a great starting point guard in Isaiah Thomas, but he doesn’t feel like a player general manager Danny Ainge will be willing to hitch his wagon too long-term. Thomas is undersized at 5-foot-9 and can’t play a lick of defense. Look for Boston to go with the best overall player in the draft at No. 1 by taking Washington Huskies point guard Markelle Fultz with that selection. Fultz looks to be a solid, offensive-minded point guard with great ball-handling abilities. 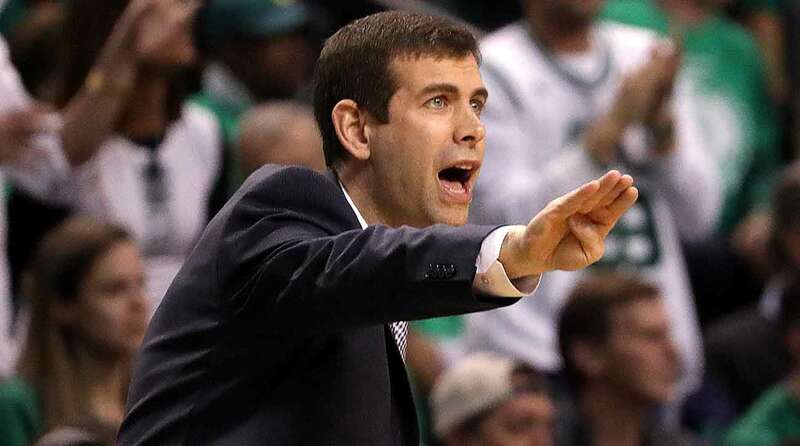 He could prove to be a respectable defensive player under head coach Brad Stevens’ tutelage.